Why Focus on Lethal Drones? Your most recent work has concerned the lethal use of drones. What inspired you to tackle this important, but little acknowledged problem? Laurie Calhoun: I have been writing essays on war since the 1999 NATO bombing of Kosovo. In 2013, I published War and Delusion: A Critical Examination, which is a comprehensive critique of the “just war” paradigm. After about a decade of research and thinking about the morality of war, I came to the conclusion that just war theory is no more and no less than a powerful rhetorical tool of propaganda used by leaders to galvanize support for their wars. The early just war theorists came up with a framework which expanded the domain of permissible homicide. Leaders needed some kind of theoretical apparatus to rationalize going to war but without violating the most fundamental commandment of Christianity: Thou Shalt Not Kill. The banner of “just war” has been carried into battle by troops at the behest of their leaders ever since. Modern just war theorists write as though their paradigm restrained war makers, but any group could establish a nation and appoint as its “legitimate authority” any of its members. Because “legitimate authorities” themselves possess the prerogative to interpret all of the other requirements of just war theory (jus ad bellum and jus in bello), this framework, far from limiting war, provides leaders with a template to use in persuading the populace to support the use of military force through fallacious appeals to tradition and authority. The word ‘war’ is used today to denote a practice which the fathers of just war theory (Augustine, Aquinas, et al.) would not recognize. Among other glaring differences, there were no means of aerial transport before the twentieth century, much less weapons of mass destruction (WMD). We also affirm human rights, which were unheard of in ancient and medieval times. Understandably, given its origins, just war theory ignores the moral personhood of everyone involved in war except the leaders. During wartime, soldiers and civilians under bombing are treated as mere subjects, with no control over their destiny. The recent development of lethal drone technology makes it possible for soldiers to kill without risking death, which is a major paradigm shift in the history of warfare. President Obama and his “drone czar” advisor John Brennan characterize their remote-control killing campaigns in “just war” speak—calling it “proportional”, a “last resort”, etc. The fact that assassination using lethal drones has been facilely labeled “just war” and accepted as legitimate with nearly no public debate corroborates my view about the value of the just war paradigm. After completing War and Delusion, I was working on another volume focusing specifically on the lethal-centrism of modern Western approaches to foreign policy. I decided to narrow the focus to drones when I recognized that no one had published a comprehensive moral critique of remote-control killing, which strikes me as a deeply disturbing development in the history of warfare. The use of lethal drones to assassinate suspects abroad in “battlefields” stipulated as such by the killers also represents an abandonment of many democratic triumphs, not only human rights, but transparency and due process, which took centuries for human beings to develop and codify formally in institutions. Anti-drone activists have resolutely denounced drone killing as murder from the very beginning. The populace, however, has been for the most part persuaded to agree with political leaders that the use of lethal drones to dispatch targets is a form of “smart war”, which spares soldiers’ lives while eliminating “evil enemies”. Before I began work on We Kill Because We Can: From Soldiering to Assassination in the Drone Age (2015), there were some books offering a journalistic approach to targeted killing. I wanted to conduct a thorough moral and philosophical analysis which would take seriously the perspectives of both sides, the advocates and the opponents of remote-control killing. I wanted to explain in detail what seems obvious to staunch critics of targeted killing but not at all obvious to champions of the practice. My impression is that many citizens have not given the topic very much, if any, thought, having come to accept without questioning the government’s official stories. In my critique, I compare drone killing with black-op assassination and contract killing by hitmen to illuminate how the practice contradicts principles which we claim to uphold in civil society. I also consider how drone killing is symptomatic of what has become a “lethal obsession” among modern Western foreign policymakers. Political leaders assume that homicide is the solution to conflict, when in fact any sober look at the Middle East reveals that it is not. Some media attention has been given to military drone use in the Middle East, especially about the assassination of US citizens, but what is being left out of reports about lethal drones in the mass media? Laurie Calhoun: Everything is being left out by the mass media beyond soundbites such as “six suspected militants reportedly slain”, which convey to the populace the impression that they are being kept safe. The US government has done a great job of persuading US citizens to believe that they are being protected, but an abysmal job of making the world a safer place. In We Kill Because We Can, I cite testimony of jihadists and innocent victims who make it clear that, in addition to terrorizing entire communities of persons who never harmed or threatened any American, the drone campaigns degrade everyone’s security. Drone killing has obviously destabilized the lands where it is carried out—Yemen and Libya are two good examples. But the drone assassination of brown-skinned suspects also undermines the security conditions of people far from the Middle East, by fomenting acts of terrorism, as occurred in Paris and San Bernardino in 2015.
International legal scholars, military veterans, and activists alike have expressed concern about the blowback bound to ensue from the drone campaigns. People’s lives are being taken away from them (and their loved ones) on the basis of bribed hearsay and circumstantial evidence. The identity of many of these people is not even known, so they have arguably been victims of racial profiling, in addition to summary execution without trial. If these people were truly “soldiers”, then they would need to be provided with the opportunity to surrender in accordance with the Geneva Conventions. US government officials and other drone program supporters invariably retort to such charges that “mistakes are made” in warfare, and the targeted suspects are “unlawful combatants”, who are therefore not protected by military protocols and international law. However, drone assassination is not just “war business” as usual. There is something insidious at play here: the very psyche of Western people is being transformed by the new remote-control killing technology. People are becoming more and more inured, even numb, to the reality of state-inflicted homicide and what it means to exterminate their fellow human beings, tellingly referred to by the killers as “bug splat”. The barrier to homicide was lowered significantly by President Obama through his signature policy, “kill don’t capture.” You may have noticed that Obama does not imprison foreign suspects anymore. He just kills them all. This is a ghastly development in US history. Most people have not recognized the long-range implications of drone warfare because Obama destroys human beings abroad without sacrificing any US personnel. The effect has been to minimize domestic dissent to what is, in my view, an outrageous policy in violation of the UN Charter, the Universal Declaration of Human Rights, the Geneva Conventions, and the US Constitution. If the leader of any other nation in the world executed thousands of people abroad on mere suspicion of their possible association with extremist groups, you can be sure that he would be indicted for war crimes at the International Criminal Court (ICC) in The Hague. Even in “personality strikes”, when targets are named individuals believed to be associated with extremist groups, the missiles which aim to kill them often kill others in their stead. The US government has decreed that the unnamed male victims of military age are “Enemy Killed in Action”, unless proven otherwise. This is an appalling perversion of justice, particularly given that 86% of the detainees at Guantánamo Bay prison in Cuba were determined to have been innocent. They were turned over to the US government by paid bounty hunters. But bribed intelligence has been a major source of the US government’s kill lists as well, which implies that many of the men deliberately targeted may have been innocent, on top of all of the clear cases of collateral damage and the military-age men defined as guilty until proven innocent. It is beyond dispute that there will be blowback from all of this wanton homicide abroad, but I also feel that we are causing at the same time a much greater harm to humanity writ large by destroying some of the bravest and the brightest of the young people of Muslim communities. Consider Junaid Hussain, a twenty-one-year old British national who was taken out in Syria by a US drone in August 2015. As in many other cases—and this has been well documented by Reprieve, a human rights group in the UK—Junaid Hussain was killed in a strike after a previous missile had hit other, untargeted, people. The toll of collateral damage in these communities—the people either killed or left bereft and traumatized—is itself a grave wrong. But there are broader implications for humanity as well. Junaid Hussain was a young man suspected of being a hacker for ISIS. People may say that he was collaborating with an evil enemy, but I think that we need to pause the killing machine, step back and ask: Why was he collaborating with ISIS? The answer is clear: he was a mere child when the US government invaded Iraq in 2003, as a result of which the group of fundamentalists now known as ISIS joined forces with Al Qaeda in efforts to repel the occupiers. In the short lifetime of many of the young people now being targeted for elimination, massive amounts of carnage and chaos were caused directly by Western governments, especially the United States. If Junaid Hussain became sympathetic with anti-Western terrorists, that is because he was inspired to do so by the slaughter of hundreds of thousands of innocent, brown-skinned, Muslim people in Iraq, Afghanistan, Pakistan, Yemen, Somalia, Libya, Syria, and beyond. Recall that Osama bin Laden explicitly stated that he perpetrated the attacks of September 11, 2001, in retaliation to the 1991 Gulf War and the establishment of US military bases in Muslim lands. What did the US government do in response? They attacked Iraq again, killing even more innocent people than they had already destroyed. Preposterously, they also went on to establish even more military bases abroad than before. Does any rational person find it surprising that new extremists continue to arise out of the ashes of Afghanistan and Iraq, Pakistan, Somalia, Yemen, Libya, and Syria? How is this story supposed to end? Based on your research, what trends do you see for lethal drone use domestically, in the United States or elsewhere? Laurie Calhoun: During the twentieth century, people who repeatedly and premeditatedly stalked and hunted down human beings with the intention of ending their lives were known as sociopathic or psychopathic serial killers. In the Drone Age, uniformed soldiers are being asked to do the very same thing, even while knowing that their own lives are not in any danger when they annihilate their targets after having spied on them and their families in the manner of voyeuristic peeping Toms. Drone operators push buttons from thousands of miles away to incinerate human beings about whom they know nearly nothing. Some of the men being killed may be militants, but what is supposed to be wrong with opposing one’s government, if one lives under tyrannical rule? It’s all very disturbing, viewed from the perspective of anyone who believes in human liberty and the sanctity of human life. How did we reach the point where the president of the United States serves a Godfather-like function in authorizing the summary execution of brown-skinned poor people located in the tribal regions of other lands? Rather than protesting US policy, the leaders of other nations are being corrupted as summary execution without trial spreads to infect them as well. The practice was once exclusive to the United States and Israel, but in 2015 Britain executed some of its citizens using Predator drones. UK Prime Minister David Cameron would surely be held accountable if he ordered hitmen to take out British nationals using pistols, poisons, or strangulation wires. Is the morality and legality of the assassination of citizens transformed merely by using an alternative implement of homicide, a weapon of war such as a Hellfire missile? Many other Western states have acquired or are about to acquire the same capacity to kill by remote control. At some point, when all of these other leaders get in on the drone killing game, then no one will be able to complain without indicting their own nation. The long-term, global precedent set by Obama is in some ways worse than what George W. Bush did. Smaller countries could never get away with invading sovereign nations during peacetime. What will the US government be able to say when the leaders of other nations begin whacking their political enemies under a pretext of counter-terrorism and on the basis of secretive criteria and evidence to which only the killers are privy? Nothing. It was Obama, not Bush, who took targeted killing to an entirely new level by intentionally snuffing out US citizens, rather than indicting and trying them for crimes. Summary execution without trial is a violation of the most fundamental values which gave rise to the United States of America. The president’s executive authority derives from the very Constitution which he tyrannically violates by denying citizens their rights. Along these lines, US administrators have been pressing for censorship of the words of lethal drone critics and terrorist suspects alike. At the same time, nonviolent activists have been criminalized. This “totalitarian turn” in US history was especially evident in the use of neologism and the redefinition of terms à la George Orwell’s 1984 to “legitimate” (speciously) the government’s drone killing of suspects. In the US Department of Justice White Paper, “imminent threat” is redefined so that it no longer implies the presence of an immediate danger. Linguistic innovation and legal contortionism opened the door to homicide carried out on mere suspicion and based on secretive criteria, which is nothing new in history, but unexpected from an ostensibly democratic state founded on principles of republicanism. The US government, and now Britain as well, has stepped onto a very slippery slope. Once leaders have already decided to kill citizens without trial, why should it matter whether they are located at home or abroad? Are suspects not in fact more potentially dangerous the closer they are to the homeland? I read a few years ago that ESPN was helping the military to analyze drone videos. What were the details of this program, and is it still ongoing? Laurie Calhoun: In two chapters of We Kill Because We Can, “Death and Politics” and “Death and Taxes”, I examine the political and economic driving forces behind the lethal drone industry boom. Before being elected, Obama claimed to be an opponent of preemptive war. As president, he has exhibited unexpected enthusiasm for the preemptive assassination of terrorist suspects located far away from the homeland, even in places where there are no US nationals on the ground to protect. By now it is common knowledge that the US government has enlisted the aid of private companies in its drone program, but I do not know the details of ESPN’s involvement, [and] these arrangements tend to be shrouded in secrecy, under a pretext of State Secrets Privilege. Some of the companies have certainly been assisting in analysis of intelligence. This is rather unsettling because the employees of these firms have financial incentives for providing more and more names for kill lists. Their criteria for what implicates the suspects are bound to grow flimsier and flimsier, as would seem to be demonstrated by the very fact that “military age men” in territories deemed “hostile” are considered fair game for execution according to drone program ROE (rules of engagement). The persons being killed are assumed guilty until proven innocent, which none of them can do since they are not apprised of the fact that they are about to be killed. Nor are they provided with the opportunity to surrender—not that most of them are carrying any weapons when they are “lit up” by Hellfire missiles. I remember you making a statement on a recent Tom Woods podcast about the government setting a bad example by using violence as a solution for problems. This resonated with me because I’ve noticed how all the people we are supposed to worship commit violence to solve problems, such as military and police. Would you like to elaborate more? Laurie Calhoun: The most fundamental problem with just war theory is the concept of “legitimate authority” to wage war, which every commander in chief is said in the modern world to possess. When Kosovo and South Sudan recently established independent nations, this created two new “legitimate authorities”, according to the just war paradigm. But because nations and groups are conventionally delimited, one could imagine a group being whittled down through the removal of persons until at last only an individual remained. That individual could then claim to be the “legitimate authority” of his own private group, implying his possession of the right to wage war when he pleased, so long as he believed that the other tenets of just war theory were satisfied. I suspect that precisely this sort of thinking governs the actions of not only factional terrorists, but also the many “lone wolf” killers in the United States who take it upon themselves to slaughter groups of people under some confused idea about what “justice” demands. I firmly believe that the huge upsurge in mass killings in the United States can be attributed in part to the fact that citizens are following the lead of the government, which offers itself as an example of how to resolve conflict each time people are killed in what is referred to as “war”. The lethal centrism of the US government’s foreign policy also helps to explain why so many people are killed by police officers in the homeland. One might think that a police officer could easily incapacitate a suspect by shooting him in the leg. Instead, they seem in many cases to be shooting to kill, military style. I am quite concerned about the effects of drone killing on Western civilization more generally. In We Kill Because We Can, I examine the corruption involved in luring young persons to become professional assassins even while knowing that their own lives are not at stake, which is a dramatic departure from the concept of legitimate self-defense which we uphold in civil society. The new practice of remote-control killing represents a major rupture in Western people’s thinking about when homicide is supposed to be justified. The threshold to state execution has been lowered by Barack Obama, but the technology has predictable applications for other realms as well. I believe that it is only a matter of time before the smaller-sized lethal drones will be used domestically by organized crime. It probably is already happening. It would be the easiest and surest way to protect the killers from detection. No more problems of fingerprints or other evidence linking a killer to his victims. If drones are used in lieu of hitmen, then crime bosses will be doubly protected since there will be no way for their minions to trip up and implicate them in the murders. At some point, prospective US Air Force drone operator recruits are going to awaken to the reality that they will be able to earn much larger salaries if they agree to work for organized crime in the private sector rather than for the government. If they already have no compunction against killing their fellow human beings at the behest of commanding officers who may or may not care all that much about morality, then why not work for the highest bidder? There is currently a drone operator recruitment crisis, which is why the US government no longer restricts the role of drone operator to commissioned officers. The shortage of lethal drone operators may also be one of the reasons why combat positions were recently opened up to women. To retain operators planning to abandon the profession once their contracts expire, the US military is offering “generous” bonuses, which are however pretty paltry compared to the income typically earned by professional hitmen. I see paid killing proliferating in the homeland as a result of the spread of the new technology, but especially because of the normalization by the US government of assassination. Please provide a list of your works, whether in the past or ongoing. 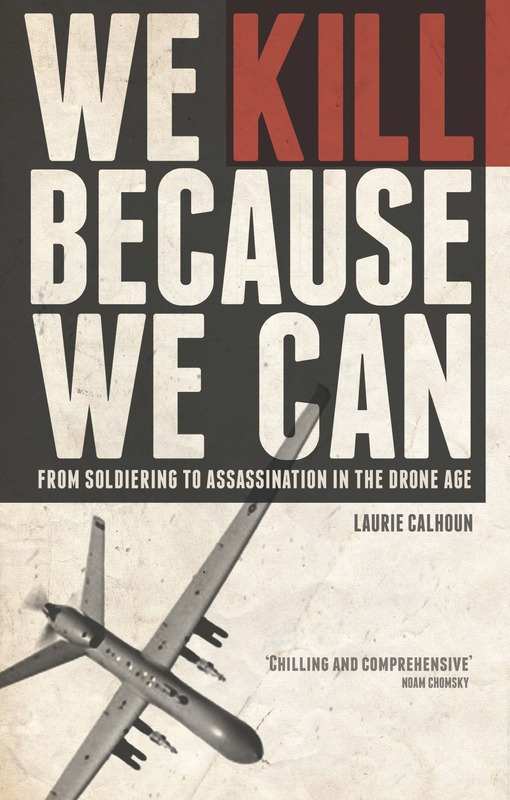 Laurie Calhoun: Both of my two recent books, We Kill Because We Can: From Soldiering to Assassination in the Drone Age (2015) and War and Delusion: A Critical Examination (2013), will be reissued in paperback editions in the fall of 2016. At my blog, The Drone Age, I have been writing commentary and essays on the latest developments in the use of lethal drones. I also have links to my interviews and publications on war. I hope that my critiques of modern war will be read and discussed more and more as people begin to recognize the disturbing implications of what is being done by their government and in their name. If citizens pay federal taxes, then they are collaborating with their government’s drone killing program. They need to find out the facts and moral implications of what they unwittingly condone. Collaborators need to consider carefully whether they can in good conscience support what is going on. What may look on the surface to be a rational and morally upright counter-terrorism tactic is nothing of the sort, for the summary execution of suspects violates the most basic principles of Western democratic societies. Previous Post Tariq Aziz. If that name does not ring a bell, you need to watch this film.